Delivering products in a timely manner? Angry customers receiving late product? Poor internal communication and loss of focus? You know your company has capacity. You know your company can produce the required product. But yet the company constantly delivers products behind schedule. This frustrates the customer. It makes your company look bad. Your key customers start looking elsewhere. What causes this? Most likely, it's the management system of keeping employees focused on deliveries. This On Time Delivery kit provides the tools, insight, and systems to rapidly improve this situation. It includes specific instructions on required meetings, meeting examples, training material, forms, and process flows to help your company focus on the critical items that support achieving on time delivery. After purchase, you will download this product, no waiting. Your Satisfaction is Guaranteed. Within 30 days, if you are not satisfied with this product, I will refund your money. 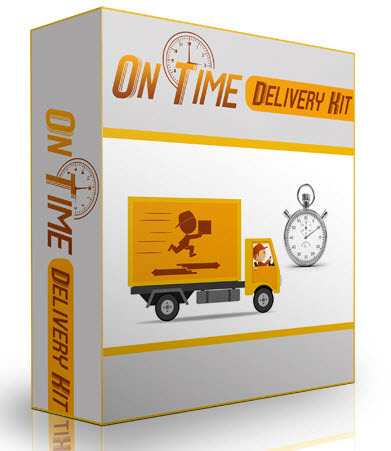 This kit contains multiple types of documents to help your company achieve On Time Delivery. It includes instructions, forms, agendas, examples, schedules, white papers and presentations. All items tie into each other. The instructions provide the details on how to easily implement a system that drives On Time Delivery. The other documents support the instructions. These tools are not difficult to implement. They provide a framework, that when followed, rapidly improves On Time Delivery. An aerospace manufacturing business coming out of the recent recession struggled to meet the demand placed upon them by their customers. The recession left this business with a significantly reduced head count and even with overtime and an outsourcing program, the company could not meet their customer's demands. The confused staff found it challenging to focus on the priorities. Priorities changed constantly; no one knew the location of the orders, and the business systems contained incomplete information. The business showed a distinct lack of on time delivery processes and missed specific necessary disciplines. Purchased this On Time Delivery kit and followed the instructions. Developed a series of routines for the key member of the production control team within the business. Created a quick, simple and direct meeting that kept each member of the team working on the right things at the right time. Ensured that the available capacity of the business was up to date through a weekly MPS review meeting. Implemented a robust contract review process that ensured that work packages / projects were appropriately loaded into the business production schedule. Within six weeks production turnover increased by just over 50%. The production control team regain control and now prevents the ‘chop and change’ production scheduling. Overtime stopped within three weeks. Within eight weeks outsourcing volumes dropped by 90%, hence enabling the company to maintain expected profit margins. Significant improvement in time delivery performance.